A science quote about the truth of the scientific purpose. This quote is a riposte to the claim by anti-scientific sections of society that science peddles lies and untruths (often at the behest of big business, drug companies, governments and other interested parties). Such critics of science are often unaware of the scientific method. A cartoon showing a person putting on a ‘thinking cap’. The thinking cap resembles a brain. 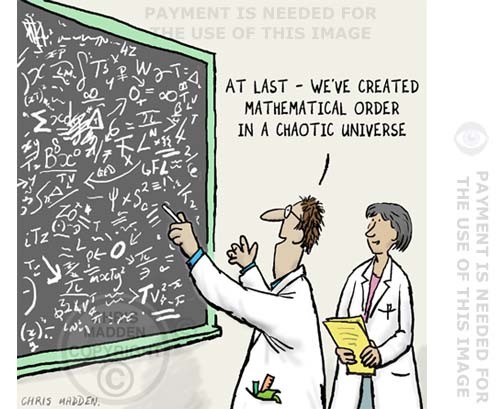 A cartoon showing mathematicians or scientists writing mathematical equations on a blackboard. 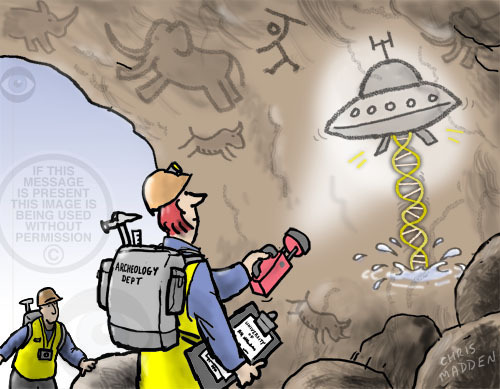 Cartoon of single-celled organisms in the primordial soup – with one that looks like a human being. 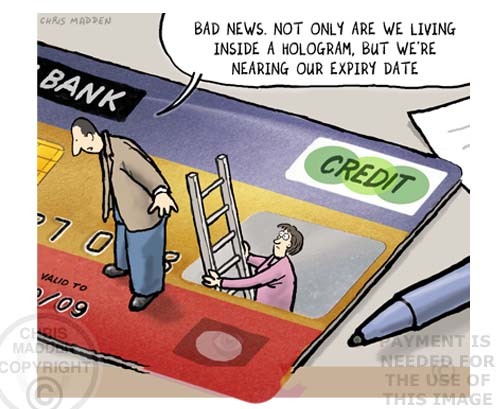 This cartoon is in a style similar to Gary Larson Far Side cartoons (A style that I’ve used since before Larson). 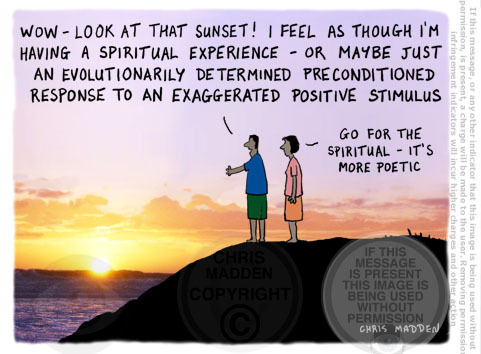 Philosophy cartoon – why do we like sunsets? Cartoon – why do we like sunsets? Why do we find sunsets spiritually uplifting? A cartoon about the fact that sensory stimuli that are of a greater than average intensity often evoke profound emotions. This applies to such things as sunsets and flowers, and is also a factor in our appreciation of the arts, from music to cinema. A comment on spirituality and pseudo-spirituallity (I’m a believer in pseudospirituality myself). Are women more intelligent than men? The cartoon shows a man trying to prove that men are more intelligent than women by asking a woman a question that the woman doesn’t know the answer to. The implication is that the fact that the woman doesn’t know the answer to the question (about football) proves that she is cleverer than the man – yet the man doesn’t realise this. The F.A. (Football Association) cup is a cup awarded to the winners of a particular football (soccer) championship. A joke about IQ, intelligence differences, evolutionary psychology and feminism. Cartoon: are women more intelligent than men? The comic shows a man using a complicated mobile phone. He is obviously very attracted to the complexity of the technology involved. A woman is saying that she’d rather just use a simpler phone. The implication is that both approaches are valid, although the superficial interpretation is that the woman’s attitude is the more intelligent. It’s meant to be ambiguous, and for people to fall into accepting the interpretation of the cartoon that they first perceive (for instance, many women will think that the cartoon is a straightforward criticism of the male obsession with technology, and most men will either think that the cartoon is just plain wrong or that it is being ironic in showing a woman thinking that she’s superior to men). 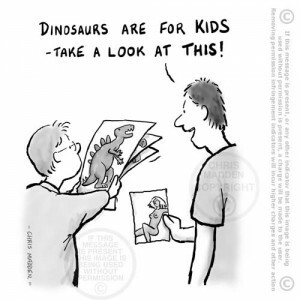 Child development cartoon – a small child looking at a picture of a dinosaur, and an older child looking at a photo of a naked young woman. Child development cartoon. Cartoon showing how children’s interests change as they get older, especially as they enter puberty and adolescence. The younger boy in the cartoon is looking at a picture of a dinosaur (as almost all young boys are interested in dinosaurs). The older (adolescent) boy is looking at a photograph of a naked young woman, and is dismissively looking down on the ‘childish’ interest in dinosaurs exhibited by the younger child. The older child is acting ‘grown up’. A cartoon about child development, adolescence, puberty, emerging sexuality, childhood innocence, testosterone, hormones kicking in.